Beindruckend war der Blick auf das Meer mit Fernblick auf Athen, sehr schöner gepflegter Garten mit großem Pool. Voll ausgestattete Küche mit großem Wohn- und Esszimmer, komfortable Betten. Vermieter sehr hilfsbereit und freundlich. Zentrale und ruhige Lage. Freundlicher, hilfsbereiter Vermieter, ruhige Lage, perfekte Wohnung mit tollem Blick aufs Meer und hauseigenem Strandzugang. Wir würden gerne nochmal dorthin fahren. het uitzicht vanaf het balcon is in een woord fantastisch.Het is een zeer ruim appartement dat van alle gemakken is voorzien. Enig commentaar dat ik zou kunnen gevenis dat de douche ruimte een beetje gedateerd is . Gyönyörű a kilátás a szobákból. Csendes, nyugodt környék. Nagyon kedves, segítőkész szállásadó. Tágas, kényelmes lakás, valóban nem a legmodernebb, de mivel szinte egész nap kirándultunk, így nem ez volt a szempont. Der Blick von der Terrasse ist wunderbar und je nach Wind hört man auch die Wellen. Der Pool ist sehr schön, und tief. Lock in a great price for Kavouri Flat – rated 8.8 by recent guests! 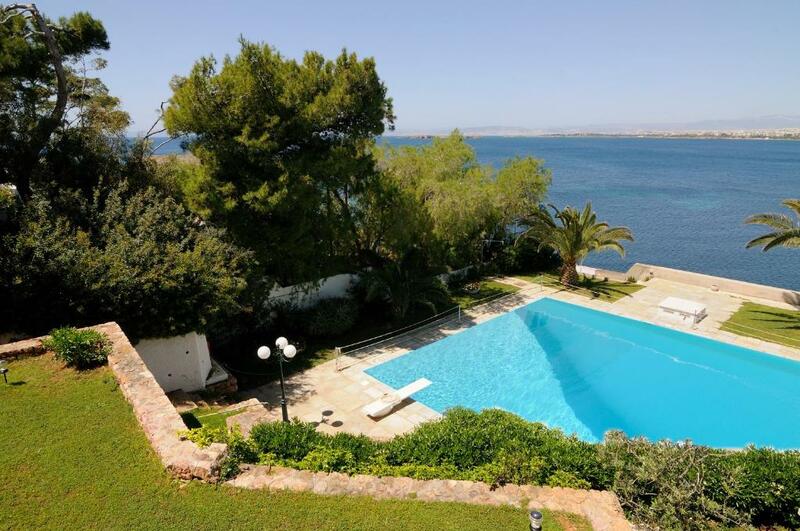 One of our top picks in Athens.Located in Kavouri in the area of Vouliagmeni, this air-conditioned apartment features 4 balconies with unobstructed sea views. The property has a swimming pool and it is within a 5-minute walk from the beach. The kitchen is fitted with washing machine and a microwave and there is a private bathroom. A TV and DVD player are featured. Other facilities at Kavouri Flat include a seasonal communal outdoor pool. Athens city center is 12 mi away, while Piraeus Port is 11 mi from Kavouri Flat. The nearest airport is Eleftherios Venizelos Airport, located 13 mi from the property. When would you like to stay at Kavouri Flat? This apartment features 4 balconies with unobstructed sea views, kitchen and DVD player. This luxurious apartment is situated at Kavouri, Vouliagmeni ,only a 25 mins drive from Athens , by the sea .Covering an area of 92m2 ,it consists of two bedrooms,living room connected with a fully equipped kitchen,marble made bathroom and floor ,four separate, individual balconies allowing guests to enjoy the fabulous 180degree and unobstructed view of the Saronic gulf ,the communal pool and the beautiful surroundings.From the garden one reaches the beach in just 3 mins ,a 6 mins walk takes you to a nearby tennis club and shops are 10mins away.For 2017 we added a brand new dishwasher, new microwave,new fridge freezer, installed a bathroom heater , bathroom new glass cabin replacing the shower curtain.To keep you warm in the winter apart from the existing double insulated windows, airconditioners in each bedroom and the 2 mobile electric heaters for convenience we added a new bathroom heater as well as carpets in living room , seating area and both bedrooms. The apartment is just 18km from Athens and the ACROPOLIS at a very quiet and peacefull neibourghood .The popular beach of ASTIR is about 1km away and shops ,super markets as well as a variety of restaurants are 0,8-1,5km away.Take away food services is available.Free parking at the street is easy.There is a tennis club just 5 mins away and the golf course in Glyfada about 5km away.The world famous lake of Vouliagmeni with its imposing rocks, thermal waters,labyrinthine underwater tunnels, lush vegetation which create a unique geological phenomenon is just 1,3 Km away. House Rules Kavouri Flat takes special requests – add in the next step! The outdoor communal seasonal pool operates from late May till late September-early October depending on weather conditions. Please let Kavouri Flat know your expected arrival time at least 2 days in advance. You can use the Special Requests box when booking or contact the property. Please inform Kavouri Flat of your expected arrival time in advance. You can use the Special Requests box when booking, or contact the property directly using the contact details in your confirmation. Nice view and nice pool.